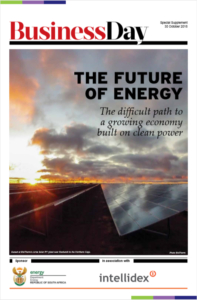 Intellidex’s The Future of Energy, a 36-page full colour supplement , was distributed in Business Day on 30 October 2018. It assesses SA’s energy sector, focusing on the state of the renewable energy industry. This is the second publication produced by Intellidex on this sector. The first, Five Years of Renewable Energy, came out two years ago when the environment was dramatically different. Then, excitement was in the air: a new industry was being developed, new businesses were starting up as a result, foreign companies were pouring investment into the country. Pride was also prevalent. From a base of zero, 6,800MW of energy capacity had been procured through four bid windows, with a third of that already contributing to the grid. For the first time, significant amounts of power were being generated by independent producers. State utility Eskom still holds a strangling grip on SA’s energy sector, but a chink had been cleaved out of its monopoly. The process had been conducted professionally by the Independent Power Producer (IPP) Office, a unit jointly set up by the energy department and National Treasury. Extremely strict security protocols and levels of efficiency that are not exactly the hallmarks of other governmental departments won the IPP Office high praise. That, and the falling prices that resulted from the auction process in which IPPs bid for prices at which they will supply electricity to Eskom, produced the sincerest form of flattery: countries across the globe emulated the IPP Office’s processes. That first publication celebrated this success. It remains a remarkable achievement for a country beset by so many socioeconomic problems. As we were going to print with it, however, there were already rumblings from discontented quarters. Eskom started raising various objections to signing the power purchase agreements with the IPPs from round four, confusing its own financial difficulties with the financing of the IPPs. Its objections, despite contradicting cabinet-level decisions, created serious delays. Compounding the issue was then-president Jacob Zuma’s nuclear ambitions and a belief that the IPPs somehow undermined them, stopped the industry’s development in its tracks. Today, the renewable energy programme is back on track but the environment is starkly different. Back then there was perhaps a naivety in the sense of achievement in that there was little understanding of the extent of damage a few corrupt people in powerful positions could cause in pursuing nefarious agendas. Today that awareness is acute, honed by the near death of SA’s renewables industry. There is now a growing sense of confidence at having overcome those travails. Having been so close to the brink, things are up and running again. But there is cautiousness too; an awareness of how quickly things can change, of how close the industry came to being permanently stunted. The excited teenager has matured into more world-weary adult, albeit one whose confidence in its abilities has been honed by its past successes, both in developing an efficient industry and in overcoming its political struggle for survival. Much of the credit for rejuvenating the renewables programme can go to Energy Minister Jeff Radebe. He wasted little time in getting Eskom to sign the round four procurement agreements with the IPPs, notwithstanding continuing resistance from the utility – which introduced an element of absurd hilarity. Last-minute court applications failed to stop the process but Eskom continued to prevaricate and delay, right up to the signing ceremony. First they said they had no mandate to sign, which was immediately dismissed as nonsense. Then they tried to renegotiate prices and were again rebuffed. Finally, at the signing ceremony, the appointed Eskom official shifted in his seat patting pockets, saying he couldn’t sign as he had no pen. The minister, with alacrity, produced one from his jacket pocket. Those 27 round four projects, Radebe announced at the signing, will inject R56m of new investment into the economy, put downward pressure on the end price of electricity and provide 61,600 full-time jobs of which 95% are for South African citizens, mostly during the construction phase. The local community equity shareholding in the 27 projects amounts to 7.1% or R1.6bn-worth, and those shareholders are likely to receive R5.9bn in dividends over the 20-year lifespan of the projects. Another R9,8bn will be spent on socioeconomic development initiatives and R3.4bn on enterprise development over the 20-year contract periods. Radebe’s next big achievement has been the publishing of the draft Integrated Resource Plan (IRP) 2018, again in the face of resistance, this time spearheaded by the National Union of Mineworkers. That maps a path for South Africa’s energy future and instils a sense of certainty in the industry. Investment decisions can be made accordingly. The main focus of this publication is on the future of energy in SA. It’s an exciting time: the IRP opens the way for independent power producers within coal and gas, introducing new elements of competition for Eskom. Indeed, the future structure of Eskom is pivotal to the future shape of the industry, and we explore options that might improve operational efficiency and financial sustainability. And the renewables industry itself is ever-evolving, with technological advancements and falling costs making it a compelling solution to the ever-increasing urgency with which planet Earth has to address the consequences of global warming.